Residents of Bikuthanda tribal village in Andhra Pradesh’s Khammam district are a worried lot. The village’s only water stream, which was till recently their primary source of drinking water, has turned grey because of polluting industries nearby. Residents say water from the Bhoodidavagu stream, which means stream of ash, causes itching and skin diseases. “We are scared of even touching the water. 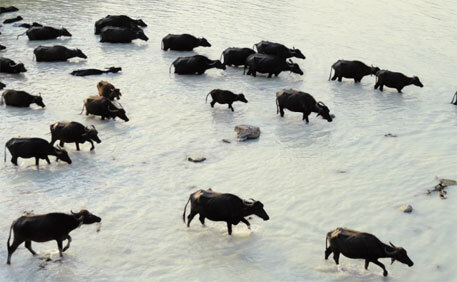 Cattle have died after drinking water from this stream,” says 40-year-old resident Sona B.
Bikuthanda is one of the villages in the Paloncha block that falls under the integrated tribal development programme that was created to develop the tribes in the area. But in reality, Paloncha, along with neighbouring Kothagudem block, is home to highly polluting industries, including the Kothagudem thermal power station (KTPS), Nava Bharat Ferro Alloys, Sponge Iron India Limited and the coal mines of the National Mineral Development Corporation. The projects are affecting residents in 27 villages, including Bikuthanda. Waste water and fly ash from the coal-based KTPS, located three kilometres from Bikuthanda, has contaminated the Bhoodidavagu stream. The 12 chimneys of the station emit thick black smoke day and night, and the plant discharges effluents directly into the water body, say the residents. The contamination of the stream has forced the residents to dig bore wells. “But most of them are dry because water level has gone down by 100-120 metres,” says K Ramulu, sarpanch of Somalagudem grama panchayat, which has nine villages including Bikuthanda. Residents also say the quality of groundwater has deteriorated because of stream contamination. The condition of Suranam, another affected village in Paloncha, is worse. The village, which is hardly 500 metres from the ash pond of the plant, is always under a thick cover of fly ash. “We can’t grow anything,” says J Lakshmamma, a 60-year-old tribal woman suffering from severe asthma and skin allergies. Her husband J Veeranna is a chronic bronchitis patient. “Please help us,” they plead with folded hands. KTPS is one of the six coal-based thermal power plants owned by the Andhra Pradesh Power Generation Corporation, the third largest power generation utility in the country. KTPS was started in July 1966 with 60 MW installed capacity. Within one year, the installed capacity was increased four times. At present, the station has 11 units operating with a total installed capacity of 1,720 MW. Eight of the units are 36 to 48 years old, and are highly inefficient and polluting. “The authorities went on adding capacity without doing anything to control pollution,” says Ramesh Rathode of Green Earth Society, a non-profit in Paloncha. Officials at the state pollution control board’s (PCB) regional office in Kothagudem, 10 km from the thermal station, confirm high levels of air and water pollution. “The level of suspended particulate matter emission should not exceed 150 milligram per normal cubic metre (mg/Nm3). However, our random inspections of KTPS units have revealed that suspended particulate matter level at times has gone up to 1,000 mg/Nm3,” says M Narayana, environmental engineer, PCB. “KTPS is using inferior quality coal with 50-60 per cent ash content. The facilities were designed for coal with ash content up to 35 per cent,” says Narayana. PCB issued over 10 show-cause notices to KTPS between 2007 and 2014 for violating provisions of the Water (Prevention and Control of Pollution) Act 1974 and the Air (Prevention and Control of Pollution) Act 1981. It has also issued specific directions to the company to take time-bound actions to comply with the regulations. The last notice was sent in January this year. In a notice to KTPS in 2008, the PCB observed that the industry was letting out the ash slurry into Karakavagu, a fresh water stream (Bhoodidavagu is a part of Karakavagu). The stream, after getting contaminated, merges with the Kinnersani river, a major tributary of the Godavari. The river passes through the Kinnersani Wildlife Sanctuary before joining the Godavari. The water stream, from Bhoodidavagu to Godavari, is getting polluted due to the direct discharge of ash slurry by KTPS. Ideally, the ash slurry should be safely disposed in an ash pond. Air emissions as well as water pollution from KTPS have serious health impacts on the community. Doctors in Paloncha confirm prolonged exposure to air and water pollution is leading to higher incidence of respiratory diseases, tuberculosis, skin diseases, blurring of vision and irritation in the eyes. “Every day we get four to five patients with respiratory disorders,” says Mukkandeswara Rao, a doctor with the community health centre in Paloncha. The health centre also receives 40-50 tuberculosis cases every month. According to Somaraja Dwara, a doctor working in a primary health centre near Paloncha, one in every 10 daily outpatients has symptoms of tuberculosis. “The reason could be the intake of contaminated water,” he says. A survey conducted in January this year by non-profit Manasa Academy in Paloncha found 15 of the 750 participants had cancer. “Health of the people in Paloncha is deteriorating,” says T Prabhukumar, director of the academy. The poor quality of the stream has affected the livelihood of the people in the villages. The residents of Bikuthanda are forced to divert water from the ash pond to their paddy fields. “The plant officers say ash will enrich the soil. But actually we feel yield is reducing,” says Sona, who grows paddy. She says she hires labourers to remove ash from the fields. Cotton farmers from the area complain the colour of cotton is changing. “The quality of the cotton is considered poor and we are forced to sell at lower prices,” says Veeranna B, a Bikuthanda resident. The yield of milk from the cattle has also reduced, forcing people to sell their cattle. KTPS, which promised employment to the residents, has failed to generate substantial employment. In 2006, during a public hearing for the stage six of the plant, the KTPS authorities had promised employment to 10,000 people from local communities. They had also promised to develop a green belt and distribute plants free of cost. “In the past 48 years, KTPS has given jobs to only about 1,500 people in the region. It did not keep the promise of developing a green belt and distributing plant seeds,” Prabhukumar says. According to KTPS records, the company has planted trees on its campus, conducted medical camps and opened a hospital for its employees. “But the steps are grossly inadequate. The medical camps are not regular and the residents seldom get to know about them. Also, hardly anybody from the villages works in the plant as a permanent employee to avail the hospital services,”Ã”Ã‡Ãªsays Prabhukumar. Down To Earth tried contacting KTPS managing director, but he was available for comments. Ignoring all complaints, the Andhra Pradesh Power Generation Corporation is going ahead with its new project to add 800 MW to the installed capacity of KTPS. A public hearing for the expansion is scheduled in May. As a result, activists are now trying to make pollution an election issue by urging people not to cast votes for candidates who are not ready to take up the issue. They have also appealed to political parties to include protection of environment in their election manifestos. I am surprised that the Kothagundam thermal power plant is not adhering to basic pollution norms. The local PCB is expressing helplessness. This is shocking because PCBs have enormous powers to stop polluting industries and have used their power to close polluting industries. Either the local PCB lacks the courage to force the power plant or is a puppet in the hands of the local government which is running the KTPS. I have seen clean thermal power plants which have stacks clean and without any pollutant other than of course carbon dioxide. Dry fly ash from such plants is being readily used for cement production. KTPS should be forced to adapt such measures within a stipulated time say 6 months failing which it should be closed. If this causes power shortages in the state, let the State Government make proper arrangements. Sir, Many thanks to your website for taking up the issue of pollution issue in Kothagudem & Palooncha.It is a fact that apart from KTPS, Singareni collieries is also contributing to severe pollution in Kothagudem and surrounding areas due to opencast coal mines. Authorities are not taking action as these two are Govt.organisations. The district of Khammam is blessed with greenery and beautiful forests. Majority of the people are tribals who are otherwise innocent.The worst sufferers due to this pollution is children and women. Wish the NGO organisations concentrate on the pollution at Kothagudem & Paloncha and pressure the authorities to take corrective steps.